Carrigaline fire brigade was formed in 1993 the first recruits were sent to Bandon fire station for recruit training which was followed by extensive training with other Brigade's (CROSSHAVEN, BANDON, KINSALE, and BALLINCOLLIG). We were turning out with these Brigades to all types of incidents. At this time we were responding from a rented unit in the carrigaline pottery complex. 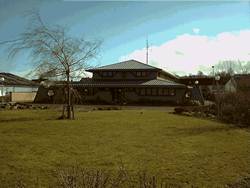 We moved into our new station on July 24 of 1995 and at the end of this year we went on the run as a first turn out station. Our ACFO was Mr L O'Sullivan a man of many year's experience and expertise. When Mr OSullivan retired in January 1999 Mr Seamus Coughlan took up his position. Mr Coughlan had previously been ACFO in Mallow for the North Cork area. Carrigaline is situated 7 mile's South of Cork City. It has an estimated population of 14,000 and is still growing. There is a vast array of industry in the surrounding area. Cork City is the second capital of Ireland with a fast growing population and an even faster growing industrial area. Cork is also known as the chemical capital of Ireland with the biggest chemical industries in Ireland, many of which are in our fireground. Cork also has a large busy natural harbour with a vast water frontage in our fireground and busy docks in use day and night. Many of the docks are deep-water docks so the ships are not reliable on tides. The ships that use the docks can carry anything from cattle to chemicals. We also have a busy ferry terminal that carrys both cars and lorrys with their passengers from the UK and EUROPE. Carrigaline fire brigade is a retained fire station with its crew being on call 24hr's a day 7-day's a week 52 week's of the year. We have two class B water tender's a GMC rescue unit and a ford courier van. Here is a picture of our appliance bay door's which is at the side of the Station.The Station is based on a Japanese pagoda style building and was designed by Architect Mr.Denis deasy. 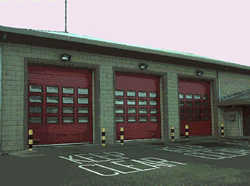 Carrigaline fire and rescue were one of the first fire stations in Cork to go into the CAMP system. CAMP is the computer aided mobilisation project. When a member of the public need's help from the fire service they will phone 999 or 112 which will put them in touch with an emergency operator. The operator will then check on their computer to find the nearest fire brigade to the incident and set off the pagers to mobilise the crew to the fire station. When the fire fighter is alerted by the pager he or she will stop what ever they are doing and make their way to the fire station. Where they will find all the information on a fax sent by control.